1. A lovely little heart ring by Verameat (also available at Vincent Park in Vancouver). 2. Shawl from Marche St. George (thanks to your Vitamin Daily post!). 3. Dolce Vita Kimora Sweater (also available at Vincent Park in Vancouver). 4. I would add this little lovely to my wishlist! 5. I’ve been coveting this LL Bean Town and Field Leather Tote for a few Christmases now. Santa doesn’t seem to be taking the hint. LL Bean Totes are always on my list, in any form. 6. I’m a big fan of all things moose (it’s a very very long and complicated story that ends in pyjamas)… so when I found this, I instantly dropped some pretty major hints. Plus it’s under $20! 7. I’m also a Moleskine devotee and have always wanted one of their “Passions” lines of notebooks. 8. While my wish list is full of all things shiny and sparkly (think gold watch and sequin pumps), at the top of my list is something I never thought I’d see… a practical item. The Milly Luggage Lock Camille Coat is stunning. A way to keep warm while looking stylish this winter? Sign me up! 9. My hubby and I are on a tight budget this year. This way, he can pick and choose items he wants to get me and they won’t break the bank! 10. Am I the only one completely obsessed with the fashion on Once Upon a Time? Not only are the princess gowns fairytale-worthy, the ‘real-life’ characters’ have some fantastic outfits, too. Main character Emma has a penchant for leather jackets, especially those from ocean drive leather, located in Vancouver. Love Emma’s signature red jacket, but I’ve my eye on the gorgeous camel one. 11. Is Everyone Hanging Out Without Me? (And Other Concerns) by Mindy Kaling: A funny girl who can write? Big time girl crush alert. 12. Michael Kors Quinn Clutch in Kiwi: I love the clean, modern lines of this clutch. The contrast of the soft vachetta leather goes well against the gold clasp, and the fresh color makes this easily wearable year-round. 13. Small crystal encrusted oval cup pendant necklace by Alexis Bittar: This one is my personal favorite – beautifully crafted and easily transferable from day to night. 14. I’m hoping for an iPad because it’s a fun toy and my computer is breaking my back from carrying it around too much. 15. A matte bangle from The Twisted Series by hk +np studio. 16. ANY painting from the lovely and talented Andrea Armstrong. 17. I have been wanting to complete my bedroom for sometime now and I feel these gorgeous nightstands would do the trick! P.S. There are plenty more wishes where these came from. 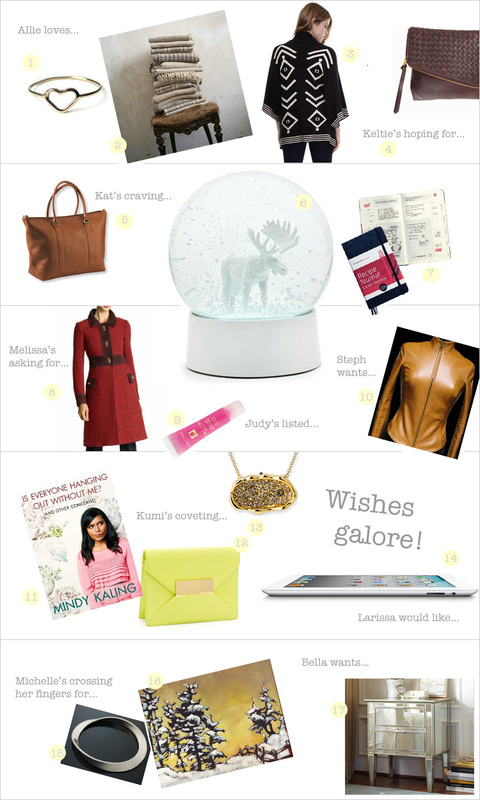 Take a look at wish lists by Boston-based food blogger Camille Barichello, stylish mommy blogger Anna Cohen and makeup artist Emmy Beaton. The layout of this is amazing! And it’s filled with such great items! I’ve already been looking through them and my wish list is growing! Thanks for including me in this collab Kelsey! So many gorgeous goodies – though I do feel a bit bad now that I didn’t ask for world peace :) Thanks for including my item! Maybe if I pass this along to the boy he’ll get the hint, he he. I’ve been coveting that Christopher Kon clutch myself! But which colour?? Brown, black, camel,….or orange maybe?? ?